If you have an Invisible Fence® brand pet containment system, we can offer you a generous trade-in discount to upgrade your system to top of the line Pet Stop brand equipment. Offering many more firmware-based programming opportunities as well as GentleSteps™ Training capabilities and Comfort Contacts™, Pet Stop pet fencing products are well known as the best in the industry. Pet Stop products are also designed and manufactured right here in the USA, while Invisible Fence®, along with sister brands Petsafe® and Innotek®, are made by Radio Systems Corporation in - you guessed it - China. We also offer upgrade allowances for Petsafe® Underground Fences, Innotek Dog Fence®, Dog Guard® Pet Fencing, or Dogwatch® Hidden Fence pet containment systems. 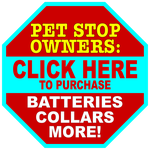 Additionally, our online divisions carry batteries for all dog fence brands. For FREE Product Information, FREE Email Support Answers, and FREE Owner's Manual Downloads for your Invisible Fence brand pet containment products, please email your request and we'll get you some answers ASAP. Click one of the links below to find a wide range of products specifically engineered for use with your Invisible fence brand pet fence system. If you don't find what you need, feel free to contact us for further assistance. Aftermarket Batteries So Good, They’re Patented. 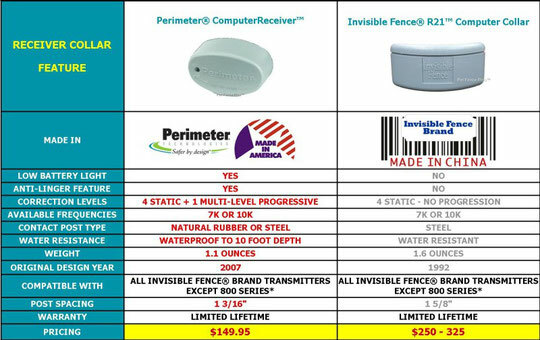 If anyone knows how important the Power Cap® is to Invisible Fence owners it would be founder John Purtell, now President of Perimeter Technologies®. John and his team created the original Power Cap to ensure the optimal performance of your fence and to keep your treasured pet safe, first and foremost - however, that didn’t mean that there wasn’t room for improvement. To help improve the battery John called on an expert, Scott Touchton, the previous Chief Engineer of Invisible Fence and the person who managed the team who invented the original Power Cap®. The goal was to eliminate mechanical failures that could jeopardize your pet’s safety, so they focused on improving the contact design for better conductivity. They wanted the battery to be more rugged and fire proof, given the recent problems with Chinese batteries. The result was a power source that was designed to impress Invisible Fence owners, and to guarantee a battery that will last longer than the original design. Perimeter Technologies is proud to offer an aftermarket battery that discriminating Invisible Fence owners can have complete confidence is equal to or better than the original. Guaranteed. Perimeter’s patent on the battery improvements speaks for itself. And, it doesn’t hurt that you save a little cash too. Better than the R21™ receiver, but Half the Price. In the early 1990s, Invisible Fence Company introduced the R21 receiver, a vast improvement over everything else available up to that point. 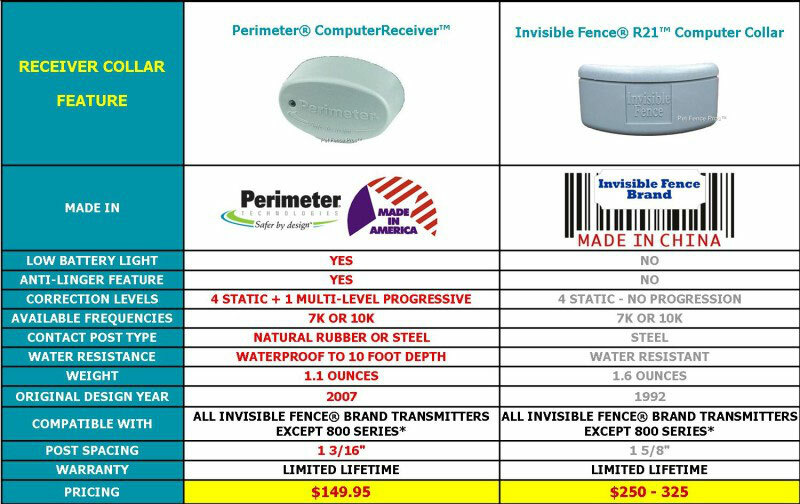 Under Invisible Fence Chief Engineer Scott Touchton, it quickly became the best-selling pet fence receiver on the market, worldwide. That was more than 17 years ago. Fast forward to 2008… technology has improved by leaps and bounds, and Invisible Fence now manufactures in China. After some “persistent persuasion” by a particular dealer, the Perimeter® team of Purtell and Touchton decided to offer advanced technology to Invisible Fence owners. 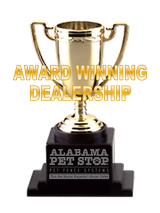 The goal this time was to add some of the superior features Pet Stop owners enjoy, while again offering American made reliability. They wanted a receiver that was more rugged and waterproof, as well as safer and more comfortable for pets - like their Pet Stop receivers. The resulting Computer Receiver is a marvel of technology. It’s smaller, ½ oz. lighter, waterproof, has a progressive correction option, a low battery warning light, and more. This product beats the R21 hands down, in every respect. Once again, Perimeter has produced a product that Invisible Fence owners can have complete confidence is Better than the R21™. The same people who helped to create the industry are still producing the best pet fence products, and now they’re doing it even better. "Wow, I'm impressed! Fits my JRT better, and works better than his R21 did. Thanks from Rowdy and me!"